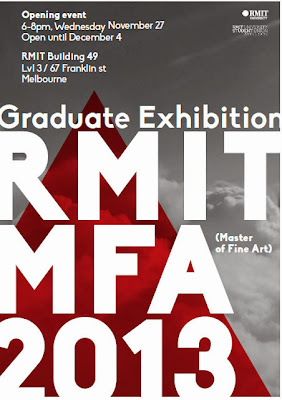 Get in quick to see this year's RMIT MFA graduate exhibition! The exhibition features the work of graduating MFA students from all visual arts disciplines, and is on at RMIT Building 49, Level 3, at 67 Franklin St, Melbourne, until tomorrow, 6 December. The exhibition invite in the image above shows the exhibition closing on 4 December, but my understanding is that the show will run until the 6th, as indicated on the website and a printed version of the invite I have in front of me. My apologies if this is incorrect!